Stewardship Tips Volunteer Calendar Stream Blog Miller Creek Photo Tour Walker Creek Photo Tour Basin Plan Clean Stormwater Monitoring Information Salmon Monitoring Program - "CSI: Highline"
Salmon Monitoring Program - "CSI: Highline"
Chum salmon spawning in Miller Creek, 2017. How many adult salmon return to Miller and Walker Creeks in Burien, Normandy Park, and SeaTac each year? How many coho salmon are dying from polluted water before they have a chance to spawn? We are finding out, thanks to many dedicated volunteers. As we learn how many of these fish are stricken by pre-spawn mortality each year, we find out how many survive long enough to lay the eggs of the next generation. 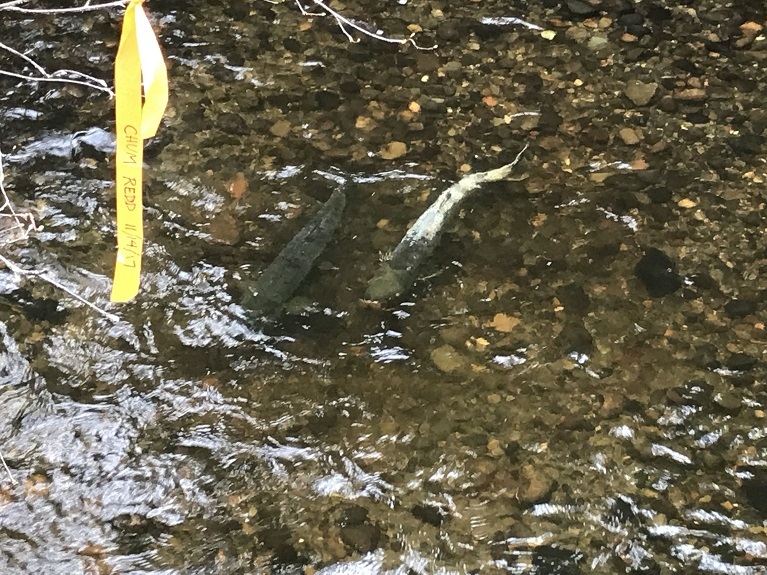 Coho pre-spawn mortality has been linked to polluted road runoff - and the good news is, filtering polluted stormwater through soils made of sand and compost makes it non-toxic to fish! A better understanding of the numbers of fish returning to the streams in the Highline community and the extent of pre-spawn mortality is one of the top recommendations the community identified as part of coordinated monitoring of the streams (see the 2009 monitoring coordination recommendations). Adult salmon in our streams are the Pacific Northwest equivalent of the “canary in the coal mine” – they reflect the health of our lands and water. This important data is helping us make priorities for the watershed and track our progress. The Community Salmon Investigation has collected salmon data since 2010 to help us learn more about this community resource. Salmon returns to Miller and Walker Creeks (2010-2017). Pre-spawn mortality observed in Miller and Walker Creeks (2010-2017). Sign up for salmon surveys in 2018! Adventurous volunteers are needed for salmon surveys starting in October 2018. To find out more and be eligible to conduct surveys, attend our 2-hour training workshop! Sign up to survey on one day a week (e.g., every Tuesday). Surveys must be completed during daylight hours. Surveys routes can be rocky, wet and slippery. Daily survey distance is about one mile. Surveys occur rain or shine, but will be cancelled for high/muddy flows. Volunteers work in pairs for safety and to ensure data quality. Volunteers count and record information on live and deceased fish. Volunteer need waders. Rubber hip waders can be purchased for around $45. For more information, email Matt Goehring or call 206-263-6826.